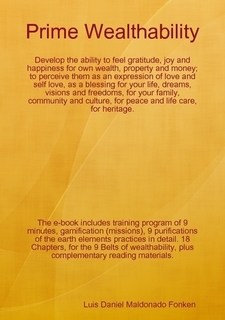 Develop the ability to feel gratitude, joy and happiness for own wealth, property and money. The Prime Wealthability QUICK SYLVER provides you a set of modules with essential training, a foundation, for the development of prime wealth ability (or the ability to generate, care, nurture and sustain wealth). Restore, harmonize, adjust your perception & relationship with your own current, past and future wealth, property and money. Purify, activate, nurture your earth element. Develop the ability to feel gratitude, joy and happiness for your own wealth, property and money; to perceive them as an expression of love and self love, as a blessing for your life, family, culture and human species. Help yourself reach a state of harmony and collaboration with the nurturing resources, forces and sources of your own life. The e-learning program: “”Prime Wealthability”” is dedicated to restore a positive and harmonious relationship with the earth element, property, money and wealth. When individuals, families, networks or cultures nurture negative feelings, ideas, concepts and emotions towards money, wealth and property they do create a conflict for themselves in relation to the earth element. What means happiness and peace? Why is the earth element so important? Which is the relationship between Wealth, Property, Money & Peace? Why Wealth, property and money are key for peace, family, culture, life care and heritage. Why is the earth element so important for life? E-book with the content of the e-learning Program, Prime Wealthability CHAPTERS 0-7/9, foundation training for the Prime Wealthability WHITE BELT. Advice, comments and answer to individuals questions by private message and collective e-forum. At the e-learning platform you will find images, charts, audio and video guidance. The e-book has the text content of the wealthability e-learning program. CHAPTER TWO: e-Learning with strategy. 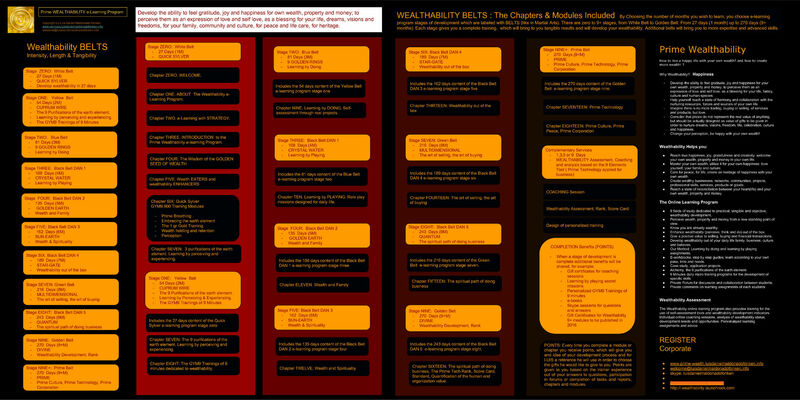 CHAPTER THREE: Introduction to the Prime Wealthability e-learning Program. CHAPTER SIX: Quick Sylver e-Training modules, alchemy methods and practices in order to make it tangible! CHAPTER SEVEN: 3 purifications of the earth element: learning my perceiving and experiencing. CHAPTER EIGHT: Learning by playing, 2 missions. CHAPTER NINE: Learning by doing, 1 application project. Detail, information on the e-learning program quicksylver, demo, and interview with the author and e-trainer. Fee: 53.00 EUR / month Paid on advanced.